Room Size: 29' long x 16' wide x 10' high (sunken living room with open floor plan, listening across width of room), moved system to opposite side of room (180 degrees  see photos) midway through review. Audio Society will get almost angry when I talk to them about sonic differences between cables. Even worse is if I bring up the subject of cable break-in. One member with an engineering background recently told me that cable break-in was a fallacy. In fact, our sadly departed reviewer John Potis once emailed me about my experiences with speaker cables. He prefaced this email query with a statement that another one of our reviewers had recently told him that a speaker cable he just purchased had essentially made his system. John was skeptical and felt this must have been an overstatement. I think I held back somewhat in my reply to John but here I will admit that I have experienced this level of difference myself. I think that audiophiles who don't hear much or any difference between cables are either deaf, in denial or simply don't have systems capable of revealing the differences. I'll admit that I had some trepidation about doing this review. For one, there are system synergy issues to consider. That is why I often try to audition components in two or three systems. Even when I've done this in past reviews and ended up criticizing a component, I've read on discussion forums how the system synergy probably wasn't right. How many systems are needed to provide a valid conclusion? Another reviewer I know insists that different manufacturers' products should not be compared in a review. In other words, he feels a product should only be reviewed in isolation and criticized against the standard of live music - not other similar products. I strongly disagree as it denies readers of information they need to make choices in a crowded marketplace. He is also adamant that each manufacturer's product is meant to excel only when used in the designer's approved system context (almost always this means with other products made by the same manufacturer or carried by his distributor) and that listening outside this context is unfair to the product. There is a parallel in the DIY world with builders installing capacitor brands in amplifiers. Some feel that too much of one sonic signature is not good so they mix brands/types. I tried both approaches in this review. With these caveats in mind, I will report my experiences with these various cables selected by personal interest as well as chance introductions. Some manufacturers also sent along their interconnect and/or power cords. I always tried them together as a one-brand set but also in many of the possible combinations. I had no intention of testing the complete matrix of all combinations as would have been dictated in my former science career. I came to this task realizing how I needed to finally attempt surpassing the performance of my homebrew speaker wire used for the past couple of years. My homebrew speaker cable is economical, allowing me to run a fifteen-foot length from speakers to equipment rack on a sidewall, thus keeping the rack out of the soundstage. However, this thinking could no longer rule my system. It was time to move the rack between the speakers so I could afford to get serious about speaker cables. Mind you, I have had a number of fairly expensive speaker cables in my system which the homebrew outperformed. However, I hadn't sampled the latest offerings on the market and figured there had to have been some progress by now. Since I own the Bastanis Prometheus speakers, it made sense to try Robert Bastanis' latest Epilog II speaker cables. While they would naturally be assumed to sound best with his speakers used upstairs, there was no reason not to try them in my downstairs system too. While researching speaker cables of less than exorbitant price, I looked into the Auditorium 23, which was being used by some of my fellow 6moons reviewers. In a casual email exchange with a European dealer, he suggested I try the Acoustic Revive SPC-PA speaker cable. I was aware of Jeff Day's review of the Acoustic Revive anti-resonance device that he loved and gave a Blue Moon award to but had heard nothing about their speaker cable. Joe Cohen, importer and distributor for Acoustic Revive products, was agreeable to sending me a pair of their speaker cables and also suggested I might like to try his Prana Nataraja speaker cables, which are very expensive. The Acoustic Revive SPC-PA uses oval-shaped PCOCC-A solid core copper for conductors. Quoting from their brochure: "Many cables on the market are made from stranded wires. Unfortunately, this type of structure allows for the leakage of stray electric current. This stray current feeds back into the main signal out of phase and creates a distorted feel to the sound. Acoustic Revive has adopted the use of single solid core conductors which are inherently free of stray current leakage. Our Single Solid Core Series features pure transmission that is entirely faithful to the original signal. The single core is covered with a natural silk tube, flexible Teflon-coated copper pipe and carbon CSF tube shielding, which acts as a 100% effective shield. 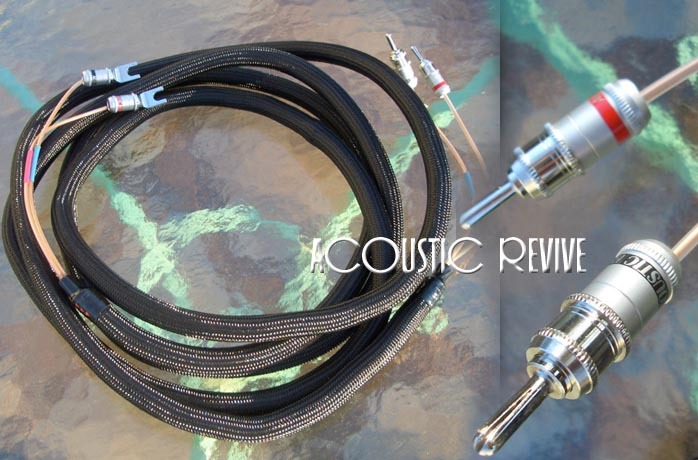 Acoustic Revive's Single Solid Core Cable series has excellent imaging, phase characteristic, a wide and deep sound stage, transparent high frequencies and a powerful and deep low end response." Additional information from the website states: "Construction is solid core copper, oval PCOCC. It is like OHNO crystal copper with a polished surface. It is then coated with Teflon and a silk sleeve. Then, it is placed inside a Teflon-coated copper conduit." 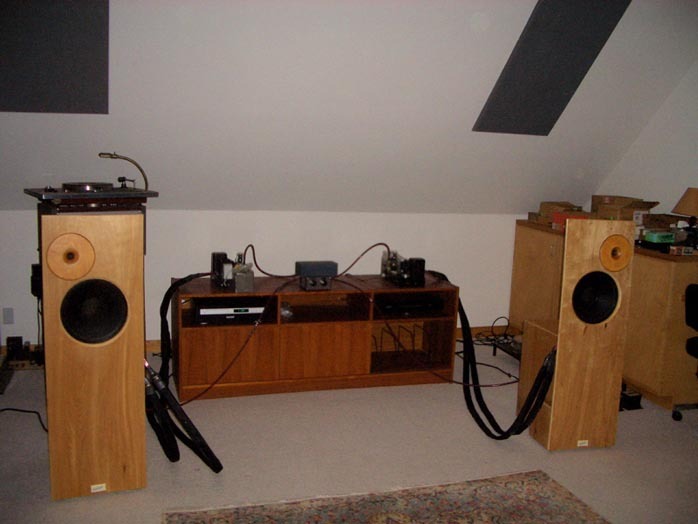 Readers should note that downstairs, I recently replaced my long-standing favorite Audio Physic Step SLE speakers and Audio Physic Luna subwoofer with a new pair of WLM LaScala towers. At 93dB, these new speakers are much more efficient than the 84dB Steps and allow use of a wide variety of tube amplifiers. 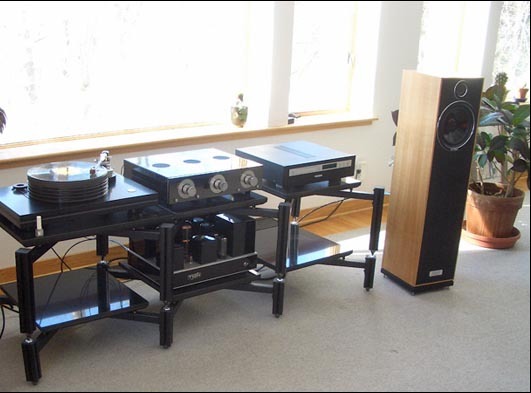 During this review, I used both my 40wpc Red Rose 2A Silver Signature and a newly purchased, used but updated 10wpc Tron 211 SET amp.